I have gotten a bunch of good comments regarding the Backup Catcher Hall of Fame idea that Chuck E. Gekas and I have been putting together. Cuzz and I take this seriously, wanting to protect the integrity of the Hall and the honor of being inducted. Last week, I saw a post that my old friend Vince Saputo made on his Facebook Wall. He listed seven men as nominees for the BCHOF. I will list his choices and the thoughts that Cuzz (my BCHOF partner) and I have on their merits. Chris Krug and Dave Ricketts-These players simply did not spend enough time in the majors to get any real consideration. Jim Pagliaroni-Pags played too much and was too good to be considered. Four years with 300+ AB's made for a nice career, but ruin his chance at the BCHOF. Carl Sawatski-Sawatski is the toughest to determine. He played a bit more than necessary later in his career, which really works against him considering his era. This one might have to go to the veterans committee for further review. Pat Corrales, Earl Averill and Doug Camilli-These three are viable candidates. They played enough games to be regular backups, but not too many to ever be considered starters. Their numbers were solid. Overall, Cuzz and I applaud Vince's effort and interest. For a first attempt, Vince's suggestions were pretty good. Other readers contributed many names. I will briefly give my thoughts on the players suggested. Some catchers just didn't have quite enough of a career to be given serious consideration. Art Kusnyer, Larry Cox and Sal Butera had some success in the majors and should be proud of their careers. They just fall short for consideration. The next group played too much. We understand that a backup catcher might be pressed into starting duty at times, but these catchers played more than half of the games in at least three years. Chris Widger, Mike Ryan and Joe Garagiola were starters too often or at least in the 'platoon' category. Joe Ferguson is in a class of his own here. For one thing, he played too much at other positions. Twice he played over 50 games in the outfield. Plus, four times he caught more than half of his team's games. Additionally, most of this was done with the Dodgers who were an excellent team. Playing a lot for bad teams might be understandable. Playing a lot for playoff teams puts Ferguson out of consideration. The final group was the biggest, proving my readers know their stuff (or at least their backup catchers). Each player in this group has the stats and the intangibles necessary for consideration. Kelly Stinnett, Paul Bako, Doug Mirabelli, Gary Bennett, Ken Rudolph, Greg Myers, Bruce Bochy, Luis Pujols, Bill Fahey, Tom Lampkin, Joe Nolan, Steve Swisher and Todd Pratt are all excellent candidates. As the years pass, I am sure many will be inducted into the BCHOF. The momentum is picking up for the BCHOF. People realize we take it seriously when we are choosing catchers who fit the standards of the BCHOF. It takes a special player. Just ask Bill Plummer, Bob Montgomery, Jeff Torborg or Duffy Dyer (aka the first group of inductees). Future BCHOFer (?) 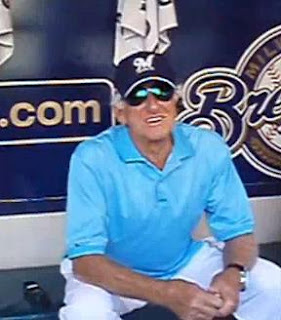 Bob Uecker in Miller Park in Milwaukee, WI-Summer 2009. Thanks. My friends and I spent 3 hours last night debating future BCHOFers active today. My favorite has to be Ramon Castro. My friend Dan likes Chad Moeller. My friend Tony likes Yorvit Torrealba.